Aurora is teaching dance in “Au’s Ballroom Dance Group”. For the lesson schedule and further information please click here. 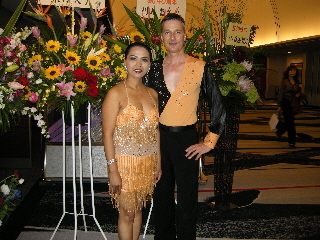 Aurora got the license as professional dance instructor from JBDF, the Japanese Ballroom Dance Federation( in 2007). JBDF was established in 1992 as a public service corporation under the jurisdiction of Ministry of Education and now (Ministry of Education, Culture, Sports, Science and Technology). She has her own dance classes under the name of “Au’s Ballroom Dance Group” teaching the 10 international standardized dances. Latin Dance (Rumba, Cha Cha Cha, Samba, Jive and Paso Doble) and Standard Dance (Waltz, Tango, Slow Foxtrot, Quickstep, Vienna Waltz). Occasionally, she also teaches Salsa, Bachata, Mambo, Merengue, Mambo, Blues, and “Japanese Jilba or Slow Swing”. At first, Aurora took dance classes from Mr. Ikko Tanaka. 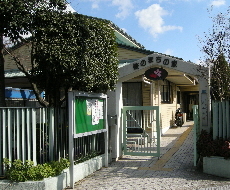 Then she continued taking classes on higher levels in the Hashimoto Yasunori Dance Studio. Here, she took her professional dance training mainly from Mr. Watanabe and a few training lessons from Ms. Etsuko Hashimoto -- former Kansai Dance Champion during their time. Mr. Watanabe spent many hours with her on the floor before the examination. 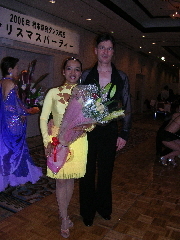 With the help of the mentioned teachers, she passed the JBDF dance instructors examination. Already since childhood, Aurora loves dancing and participated in community events, different informal parties and school performances in her home country, the Philippines, where dancing is an integral part of the culture. She encouraged Thomas to also take dance classes and to share the passion of dancing. Indeed, it turned out to be a very good success for we really enjoy doing it! Among other parties we participated in, the 40th Anniversary of the Hashimoto Yasunori Dance Studio in Miyakojima, Osaka, held at New Otani Hotel Osaka in 2009. 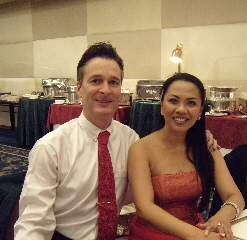 We danced Cha-Cha-Cha in front of more than four hundred participants both professional and amateur ballroom dancers. It was one of the most unforgettable experiences we had since we started dancing together. We participated in other dance parties as well. They are always an occasion to also dress up and to enjoy the company of friends and good food. Now we organize our own dance party -- once or twice a year with Aurora’s students and friends in a community center. These parties are low budget, fun, and informal. We play ballroom dance music as well as Salsa, Disco, Bachata, Raeggeton, and Techno. All guests enjoyed this wide variety of mixed dance music.